The recent passing of Melissa Stevens, heir to the Patricia Stevens Modeling School and Career College, has given us cause to take a look through one of the most extraordinary collections in LaBudde’s holdings: the Patricia Stevens Collection. This collection, which Melissa donated in November 2011, contains the company records, advertisements, photographs, and other ephemera. There are hundreds of items in over fifty boxes and together they offer a complete account of the history of the company. 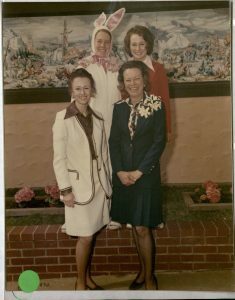 1973 photo of Flo Stevens (bottom right) and her three daughters (clockwise from bottom left) Patricia Jr, Sheila, and Melissa. One of the items Melissa Stevens donated was a large scrapbook filled with letters of appreciation written to her mother Flo. Among the letters are many from former students and employees. Flo Stevens appears to have had a special relationship with many of her graduates and employees. One student said that Flo was “the woman who changed my life.” Another wished “I could explain how much I think of you. You have been like a big sister to me and you have my deepest respect.” Still another told Flo that “my heart had adopted you as a second mother.” Other students wrote about how the Stevens school could help them with self-esteem issues or help them conquer their fears. Some of her graduates went on to pursue careers in acting or fashion, or interior design. Reading their letters, they all give some credit to Florence Stevens for their success. The most poignant letter in the collection is from one of Stevens’ employees. She [find her name] writes to Flo about a 14 year old girl – Marilyn – who wanted to be a model and was attending classes against her parents’ wishes. Her parents believed that any kind of modeling would “lower [Marilyn’s] morals” and corrupt her. The letter explains that Marilyn might not be destined for a modeling career, but that she at least deserved the chance to follow her dreams, even if she was still young. There is, I think, a contradiction buried at the heart of the Stevens collection. On one hand, the modeling school may seem anachronistic by today’s standards. Expectations for women were undoubtedly different in the 1960s and 70s than they are now. On the other hand, based on these letters Stevens’ modeling, etiquette and career-related courses do seem to have changed young women’s lives for the better. Women in the 1960s and 70s were starting to make social gains that still haven’t been fully realized. The Stevens school embodies both of those: recognizing that even though women were still expected to behave in certain ways, there were also new opportunities opening up for them, and they would need appropriate education and training in order to succeed. In short, Stevens tried to provide both of those. Perhaps then there is more to the modeling school than meets the eye. Projecting our modern ideas backwards even a couple generations isn’t always wise. As antiquated, unhealthy, and even incorrect as instruction about posture, diet, personal care and etiquette may have been, it’s clear at least some of Stevens’ students found what they learned empowering and that they credited her with helping them improve their lives. This spring, a new exhibit is opening in Miller-Nichols library and at locations around Kansas City. Titled “Making History: Kansas City and the Rise of Gay Rights,” the exhibit explores Kansas City’s surprising role in the US gay rights movement of the 1960s. The exhibit opened April 19 at UMKC’s Miller Nichols Library (800 E. 51st Street) and will be on view through September 30. If you want to learn more, you’ll need to see the exhibit. However, for a special post this week I thought I would share my perspective as one of the contributing curators. I can’t speak for everyone who worked on the project, but I hope my experience gives readers a taste of what its like to work with the “stuff” of history and turn it into an exhibit panel. Most of the time, the history that you see in an exhibit or read in a book is just the tip of a very big iceberg. Historians deal in a particular type of story – we call them “narratives.” A narrative is a vehicle for explaining how and why certain events in the human past happened the way they did. We use narratives the way Physicists use models – to explain how and why systems work. In our case, our system is the whole of past human affairs and the narrative is a model for why some of the atoms (humans) behaved the way they did. Coming up with one of these models means balancing between staying true to the historical evidence and inferring something more from the evidence that makes it part of an interpretation. Having just the facts, with no interpretation or narrative, results in the dry “history” you hated in high school. Just a narrative with no supporting evidence? That’s called fiction. Good histories mix fact and interpretation, and also answer what we call the “so what” question. This asks why is what we have to say important? What lesson can be drawn from it, or how does understanding this part of the past allow us to understand a different part better? Sometimes, particularly challenging source material makes the entire process harder. The most salient aspect of this project for me was the challenge my source material presented. My panel is about the Gay Bar scene in Kansas City in the 50s and 60s. The most amazing source material I had was a huge set of pictures taken at a few different bars.The problem I faced was a difficulty to do either one at all. In some cases these were just pictures of people. The subject, date, and location were unknown. Pictures of people at a bar is not history. I was going to have to make some judgements about what I was looking at and why it was important. On the other hand, these were like people’s Facebook photos. Who am I to draw any sort of conclusion about what they “mean” or what the “significance” is? I wasn’t there. I don’t know them. Picture from the GLAMA collection, similar to the ones I worked with. The people, place, and date are unknown. I’ve never been at such a loss about how to interpret a source, in part because I felt as if any interpretation violated someones privacy. Then I realized the answer lay in the problem: the intimacy of the photos was the lesson. These photos show how important gay bars were at that time because they were a place where people could be intimate, or could take pictures together without fear of repercussions. My panel presents the photos without telling you a great deal about who those people were. But it does tell a story about why gay bars were so important. If you ask me what these photos “mean” in an historical sense, I’d say they’re evidence that bars were special places for gays and lesbians in the 1950s and 60s. You can see it in the pictures they took. The above quote is from a 2010 online exhibit made by LaBudde Special Collections to commemorate thirty years of The Pitch. Now, as the paper changes back to a monthly format, we thought it appropriate to revisit that exhibit. In this post, we’ll take a closer look at some of the historical, insightful, colorful, and even unusual stories that made the pages of The Pitch in the 1980s. This back page contains a letter to the editor and an promo for the record store. The first issue of Penny Pitch came out in July 1980. Clearly the paper had a long evolution ahead of it. 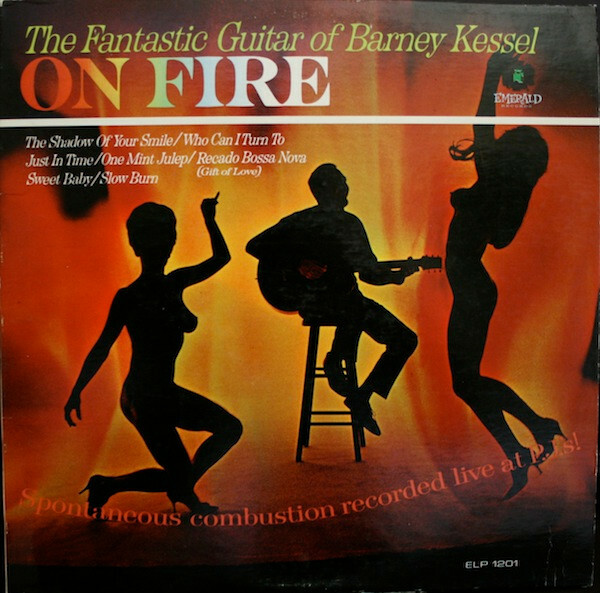 The two top headlines were a tanning contest sponsored by KY102, and an interesting story by editor Warren Stylus about Penny Lane’s unique stock of records (Stylus being either a pseudonym, or a perfect last name for a music writer). The tanning contest seems to have been underwhelming, a fact the writer attributed to ash from Mt. St. Helens still blocking out the sun over Kansas City. For those who may not remember, Mt. St. Helens had erupted just a few weeks prior in May, 1980. Stylus’ story is more interesting. He chronicles the story of The House, an important distributor of small independent record labels – over 350 according to Stylus. The House had a colorful history, first occupying an actual house in St. Louis, then the limestone caves around 31st St in Kansas City, before finding a home in the same building as Penny Lane. As with any first issue, the writers were finding their feet. Still, the paper established some columns and segments that would become stalwarts over the next decade. One example was the music review column known as “Ridin’ With the King” written by Leroy “LeRoi” Johnson. By 1984, the paper (now the KC Pitch) was a more serious piece. In contained interviews with major musicians, advertising for Penny Lane, and an extensive music calendar. With Stevie Ray Vaughan, Van Morrison, Robert Cray, and the Grateful Dead all coming to town in 1984, it was a good time to be a music fan in Kansas City. LeRoy “LeRoi” Johnson kept Kansas City music fans well informed on both the good and the bad of newly released records. 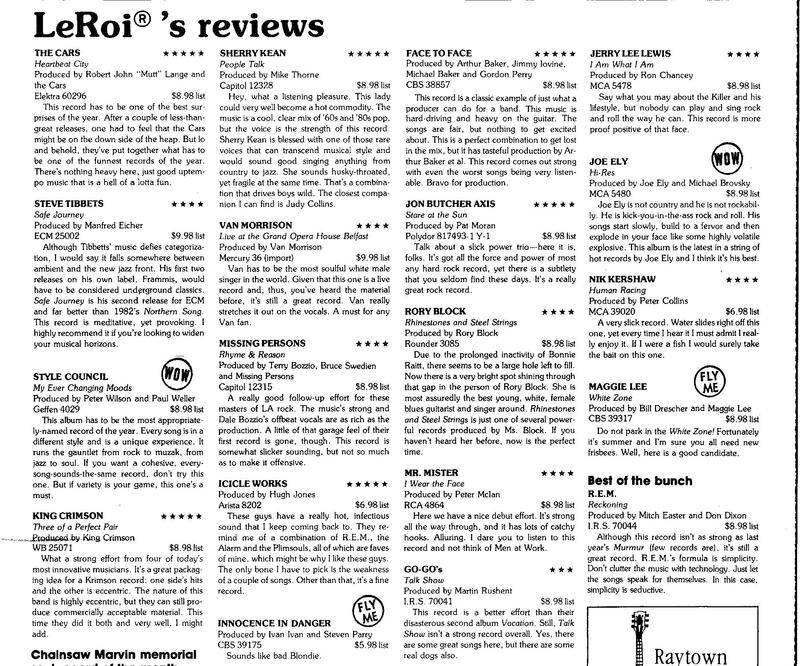 LeRoy Johnson continued to write music reviews as well. In his reviews he put a (literal) stamp of approval (“WOW”) next to records he liked, and a stamp of dis-approval (“FLY ME”) next to those he did not. The cover story for April 1984 was an interview with Jazz legend-in-the-making Ronald Shannon Jackson. Jackson was born in Fort Worth, Texas. He attended Lincoln University in Jefferson City, Missouri where he roomed with piano legend John Hicks. Shannon had formed his own band, The Decoding Society, in 1979. Shannon and his band had just returned from a tour of Asia. Of the tour, Shannon said “we were invited to do the Singapore Jazz Festival and the Malaysian Jazz Festival…most of the crowds we played for were two, three, four thousand. They have a total thirst for western music.” Shannon also theorized that Asian audiences were more likely to dance to his music because the unconventional beats he used were akin to beats used in Asian musical genres. Shannon appears to have believed that in 1984 Asian (or European) audiences had less rigid standards for what constituted “Jazz” than Americans did. As a result, they were more “accepting” of his music, although he also said Americans were getting better. Describing his musical style, Shannon said that “there is no actual lead [instrument]” in his melodies. Instead, his melodies were based on rhythms produced by traditional “background” instruments like drums or bass. In Shannon’s songs, “the drums are like a lead instrument.” The Shannon interview demonstrates how America’s signature art form – Jazz – continued to be modified by innovative performers. Critically, it also shows how worldwide audiences were attracted to American music, even if that music did not fit more rigid American audiences’ definitions. Kansas City’s jazz heritage is often thought of as an American phenomenon, but Kansas City takes on global significance when you consider jazz as an important American cultural export. The Shannon interview hints at this relationship. In October 1988, ahead of a solo appearance by Robert Plant, the KC Pitch asked “Does Kansas City hate Led Zeppelin, or does Led Zeppelin hate Kansas City?” Apparently, in 1969, the crowd at a Zeppelin show at Kansas City’s Memorial Hall booed them off the stage. This, according to writer Anthony Henge, became the first and last time Zeppelin played Kansas City until Plant and Jimmy Page made separate appearances in 1988. By 1988, the paper had grown to over 30 pages long. 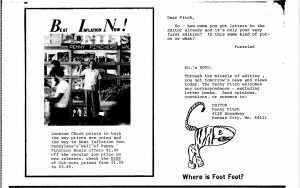 What had been a simple newsletter for a record store had become arguable the important source of entertainment news in the city. But, some things had stayed the same. LeRoi was still writing music reviews. Some of the articles still had a tongue-in-cheek style. And the paper was (and is) still free. The lion king? 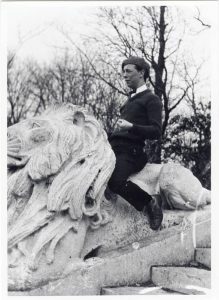 A young Walt Disney sitting atop one of the lion statues in Swope park. The LaBudde Special Collections is home to several photographs from the early life of Walt Disney and the history of Laugh-o-Gram studios. These photos can be found in the Baron Missakian collection. Missakian was a well know photographer in Kansas City during the 1920s. He photographed many famous personalities, one of whom was Walt Disney. But why did Missakian have so many photos of Disney and the processes at Laugh-O-Gram studios? The reason behind this is that Disney’s studio and Missakian’s photography office were right across the hall from one another and they were close friends. In fact, Missakian ended up marrying Disney’s personal secretary. The set of photos includes a young photo of Disney, many photos from various projects, and even a photo of him at Kansas City Film Ad company. The story of Disney’s first studio is a rough one, as most stories begin. After some time at the Kansas City Film Ad Company, Disney found that he did not like the cut-out animation style. He preferred classical hand drawn animation, but he could not convince the owner of the company to change styles. So, on May 22, 1923 Disney, along with co-worker Fred Harman, founded Laugh-o-Gram studios at 1127 East 31st Street in Kansas City. Here Disney started working on his animated films. His first twelve films were commissioned by the Newman Theater. His next big project was creating six films for Tennessee-based Pictorial Clubs. This was a big project and Disney was going to be paid eleven thousand dollars for these films when he delivered them. The six films were, “Little Red Riding Hood”, “The Four Musicians of Bremen,” “Jack and the Beanstalk,” “Goldie Locks and the Three Bears,” “Puss in Boots,” and “Cinderella” (1922). Sadly, only months after the contract was signed and the studio began working on these films, Pictorial went bankrupt and Disney was never paid. After all the time and money spent on these films, Disney moved on to find new work because the studio was in desperate need of funds. This led to Disney taking on a project for a local dentist named Thomas B. McCrum. From this job, the film “Tommy Tucker’s Tooth” was born, and Disney received five hundred dollars. Then instead of using that money to pay off his many debts, Disney started working on his newest idea. A live-action/animation entitled “Alice’s Wonderland”, which would star Virginia Davis, a young local actress. But this work only made the studio’s financial issues worse and after finishing the raw edits for the film the studio filed for bankruptcy in July 1923. As fast as he could Disney bought a ticket to Hollywood, armed with only his ideas and an unfinished reel of “Alice’s Wonderland”. The name is no coincidence: this was the first of a run of Disney-made “Alice” stories, a run that continues to this day. The other incredible thing about Laugh-O-Gram studios is that Disney is only one of the animation greats that emerged from it. 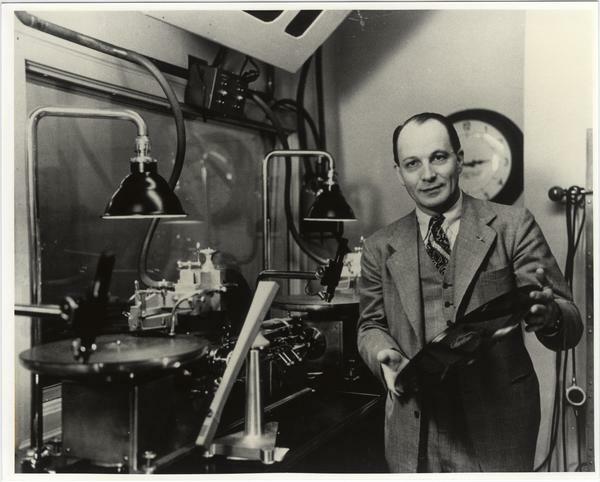 Hugh Harman (brother of Fred Harman) and Rudolf Ising (a Kansas City native) were animators who worked for Laugh-O-Gram. As a duo they later founded the animation divisions of Warner Brothers and MGM. Another Laugh-O-Gram alum, Fritz Freling, is the man responsible for creating Bugs Bunny, Porky Pig, Tweety Bird, Sylvester the Cat, and Yosemite Sam. It’s almost impossible to overstate: the Disney family tree that is Hollywood animated film making can all be traced back to Laugh-O-Gram studios. It is an incredible piece of Kansas City history, and there is a movement underway to preserve it. In 2015 the Thank You Walt Disney Foundation began renovations on the site, and put together a plan for an on-site learning experience. Until then, the photos in LaBudde Special Collections offer a window into one of the most pivotal moments the history of American film making. “Baron Missakian Collection”, MS 24, LaBudde Special Collections, University of Missouri-Kansas City. Timothy S. Susanin, Walt Before Mickey: Disney’s Early Years, 1919-1928. (Jackson: University Press of Mississippi, 2011). Imagine a young couple living in Chicago or Kansas City in 1896, who wants to move to a new city. Maybe he had a new job in a different city, or maybe they were adding to their family. Whatever the reason is, they needed to buy a new house somewhere else, which means they needed to go look at houses. They did not have a car, and even if they did there were few roads. 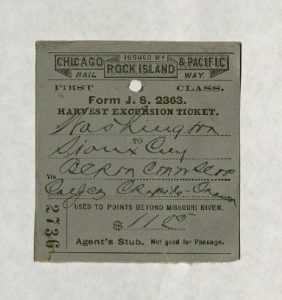 Fortunately for our fictitious home-buyers, the Chicago, Rock Island & Pacific railroad had a solution: a special type of ticket called a Home Seeker’s Package or Home Seeker’s Excursion. The J.E. 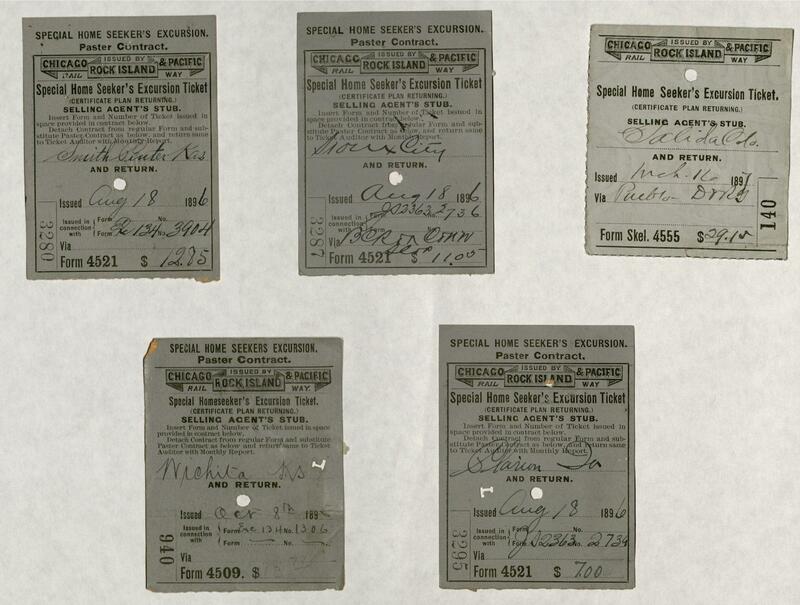 Lynn Railroad Collection in LaBudde Special Collections has several examples of these tickets. In these unassuming tickets is a story of how railroads fueled America’s growth, one prospective home buyer at a time. A variety of tickets to destinations such as Wichita, KS; Marion, GA, Sioux City, SD; and Salida, CO. When our young couple bought a home seeker excursion, they were getting a heavily discounted round trip ticket to a particular destination(s). well as harvest excursions. However, the home seeker excursions are particularly important because they illustrate the critical role railroads played in helping fill the empty parts of America. When the transcontinental railroad was being built during the 1860s, much of the rhetoric was about tying the country together. A lot of railroad development was subsidized by federal and state governments, and it is possible that is why home seeker tickets were relatively cheap. While it is easy to be cynical about such a union of naked capitalism and nationalism, it is not clear if such a robust rail network could have existed otherwise. That rail network is what enabled much of America’s growth prior to the Depression. One way was by making it easier for people like our fictional family to migrate to new parts of the country. The recording is fascinating and rather unusual for its time because of its utilization of tape delay to imitate the sound of a ringing bell via the human voice. Recorded by local studio forerunner, Vic Damon, the recording highlights all of the home improvement products sold at the retail store at the Gregory and Wornall intersection in Kansas City, MO. Damon is pictured here in his studio with record cutting lathes. The radio announcement is certainly unique because of its technique. However, it is also interesting because of its significance to the Long-Bell Lumber Co. and the Robert Alexander Long legacy in the Kansas City area. In 1956, just four years after Damon recorded the radio announcement, the once prominent Long-Bell Lumber Co. was absorbed by the International Paper Corporation. The timeline of the Long-Bell Lumber Company runs a tumultuous course where the success and wealth of the company were challenged. What started off as a booming enterprise eventually declined and faced several challenges from internal conflicts, litigation, and the Great Depression. Local historian Lenore K. Bradley referred to the early success of the Long-Bell Lumber Co. as the “Gilded Age” in her biography of Long, and it was certainly that. Long spared little expense in the creation of the ornate structures he left behind. Remnants of R. A. Long’s affluence are dispersed throughout the Kansas City area. Landmarks included in his legacy are Liberty Memorial, Longview Farm, and the Kansas City Museum. View of the west side of Corinthian Hall, now the Kansas City Museum. Bradely, Lenore K. Robert Alexander Long: A Lumberman of the Gilded Age. (Durham, NC: Forest History Society, 1989). 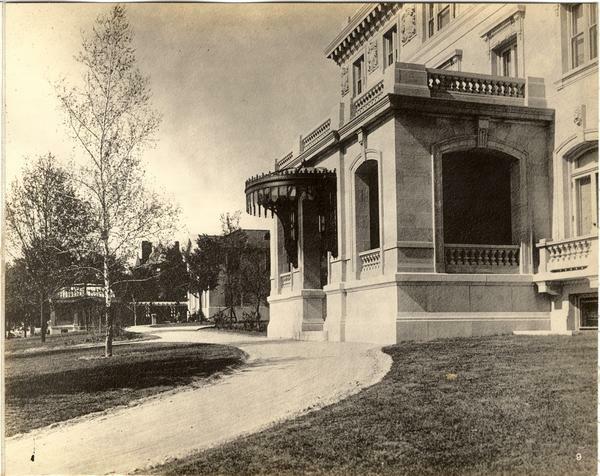 R.A. Long’s City and Country Homes Photo Album. LaBudde Special Collections, UMKC. Vic Damon Collection. LaBudde Special Collections, UMKC.